There’s no doubt that traveling can be such a pleasant thing to do. From seeing the beaches of Southeast Asia to exploring the historical sites of central Europe; it’s anyone’s dream to see and experience the world’s beauty. But let’s get real, sometimes traveling can be expensive and difficult. There are lot’s of things to consider like plane tickets, accommodations, transportation, and activities. And when you’re on a budget, things can bet overwhelming. But thankfully, there are plenty of tips and tricks that’ll make your travel convenient and budget-friendly. 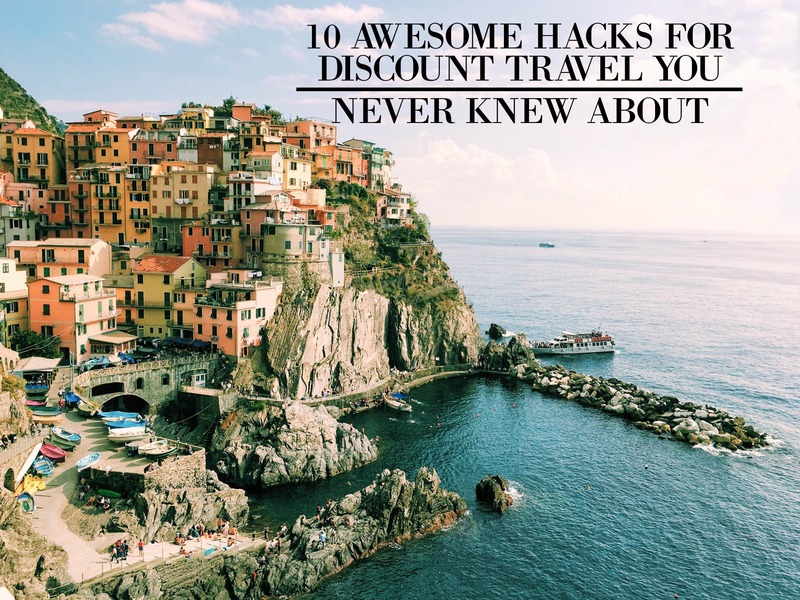 Down below I’ve gathered some discount travel ideas that’ll save you so much time and money making your life a ton easier. So check them out and let me know what you think! Consider choosing the exit row or bulkhead seat which is designed to have more leg room compared to regular economy-seats. Just be sure you can handle the responsibilities in case an emergency occurs. If you have a large carry-on bag, try booking seats in the rear of the plane. You’ll have more overhead compartments to choose from compared to the front seats. Finding a great deal ahead of time will totally save you a ton of time and money. Make it a habit to book 6 weeks in advance to get the lowest possible fare. Usually, airline rates go up in price the closer it gets to your departure date. So book ahead of time and save more. In my opinion, SkyScanner is one of the best plane ticket websites you can use. You enter in where you want to leave from and where you want to arrive, and it will find you a ticket for a cheap price. The app searches the most affordable and best options available so you’ll save more money. Instead of using your earned airline points for domestic flights, try saving it for international flights. Also, you can use these points to upgrade your seating to business or first-class tickets. You’ll be thankful later! If you want to score a budget-friendly flight, consider checking different airlines instead of exclusively using one airline. Most airlines now sell one-way flights at reasonable prices, meaning one might be cheaper for the outbound flight while the other works better for the return. Ditch the expensive hotel accommodations and try to book a budget-friendly Airnb home. The experience can be far more rewarding than a stay in a chain hotel and is a lot cheaper. You can meet a lot of friendly hosts and make friends with the locals. Studies show that the most expensive days to fly are Friday and Sunday. So try booking your flight on Tuesday, Wednesday, or Saturday, since they’re less busy days and cheaper. Make it a habit to check your luggage weight before you leave the house. This simple trick will let you easily know if you’re going to pay for excess baggage or not. You’ll save so much time and money implementing this tip. Did you know that by simply following on social media and signing up for email alerts from different airlines, you can get exclusive discounts and offers? So do yourself a little favor, subscribe, and get special fares and promotion. Alright, I hope I was able to provide value to you in this post. If there was something that I missed, wasn’t answered, or you want to know more about, let me know in the comments down below. I’d love to hear you out and answer you as best I can.